Histories of the ARPANET and Internet. It started out with a line speed of 2,400 bps (bits per second) and was later upgraded to 50,000 bps. In comparision, this essay was written using a Cogeco Internet service in Canada that has plans as fast as 1 Gbps (billion bits per second) download speed! 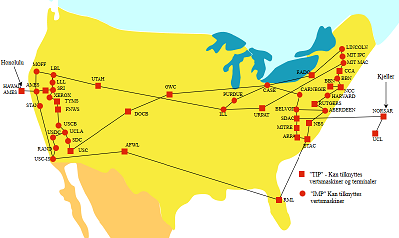 The Internet/World Wide Web grew out of ARPANET. The world's original web site went online during 1990-DEC-20. It was created by Tim Berners-Lee, OM KBE FRS FREng FRSA FBC, (1955-), a British engineer and physicist. It is still online. The world's first WWW server was a NeXT computer at CERN, the European Organization for Nuclear Research in Switzerland where he worked. "You affect the world by what you browse." "Anyone who has lost track of time when using a computer knows the propensity to dream, the urge to make dreams come true, and the tendency to miss lunch." This website -- ReligiousTolerance.org -- went online in 1995-APR. It was probably about the 15 thousandth website to go live. The site is probably older than 99.9% of the web sites on today's world wide web. That year many other web sites were created, including Altavista -- an early search engine -- and Amazon -- which needs no introduction. The Internet expanded to 1 billion unique hostnames in mid-2014. However, about 75% of them have no active web sites attached to them; they are just registered domain names, for future use or sale to others. The Internet reached its 25th anniversary on 2015-DEC-20. "This lucid but impersonal memoir conveys some vital history and intriguing philosophy concerning the Internet, written by the man who invented such ubiquitous terms as URL, HTML and World Wide Web. British-born physicist Berners-Lee is now the director of the World Wide Web Consortium, which is based at MIT and sets software standards for the Web. In the late 1980s, he wrote the first programs that set up the Web, thus revolutionizing the Internet by allowing users to hyperlink among the world's computers. It was a quantum conceptual leap, and not everyone instantly understood it. Some researchers had to be convinced that posting information was better than writing custom programs to transfer it. ..."
"Considering that the history of the Internet is perhaps better documented internally than any other technological construct, it is remarkable how shadowy its origins have been to most people, including die-hard Net-denizens! At last, Hafner and Lyon have written a well-researched story of the origins of the Internet substantiated by extensive interviews with its creators who delve into many interesting details such as the controversy surrounding the adoption of our now beloved "@" sign as the separator of usernames and machine addresses. Essential reading for anyone interested in the past -- and the future -- of the Net specifically, and telecommunications generally." "An immensely important book. ... This narrative reads like the digital equivalent of the Manhattan Project, with all the excitement of discovery, blind alleys, failure to see the obvious, and thinking beyond established norms. ... Wonderful, liberating quotes are threaded through this meticulous charting of a revolution by Johnny Ryan, in his own observations, and in those of others." Kirkus Reviews: "Fascinating and unique. ... [A] captivating behind-the-scenes tour of how (and where) the Internet works. ... [Blum] has a gift for breathing life into his subjects." Joshua Foer, author of Moonwalking with Einstein: "Every web site, every email, every instant message travels through real junctions in a real network of real cables. It’s all too awesome to behold. Andrew Blum’s fascinating book demystifies the earthly geography of this most ethereal terra incognita." Science News: "Tubes is an absorbing tale of this new technology, as well as a wonderful account of the Internet’s growth and the people who made it possible." Boston Globe: "Clever, enterprising ... Tubes uncovers an Internet that resembles nothing so much as a fantastic steam-punk version of itself." The Guardian: "Engaging. ... Full of memorable images that make the internet’s complex architecture easier to comprehend. ...Blum leaves readers pondering questions that would not have occurred to them before and better informed about an innovation most of us take for granted." "It does exist - the internet beneath the internet. If your curiosity of the dark web has brought you to this book - then you have come to the right place. 'Dark Web: Exploration of the Deep Web' from Kash Laden is your gateway to a hidden internet that is not accessible through traditional means. ..."
"If you want to know how to access the infamous Dark Web and then explore what you have found then this succinct guide is all you need. There are links to Dark Web websites scattered throughout the book to ensure you get the most from your journey underground."